Science reporting is hard to get right. The New York Times tries their best and has a great team in their science section, but the science reporting is sometimes a bit rough in the other sections. I recently came across an error in their Europe section which remains uncorrected despite my best efforts, so I thought it would be fair to share here. There’s nothing wrong with the image — it’s from the IRSN press release. 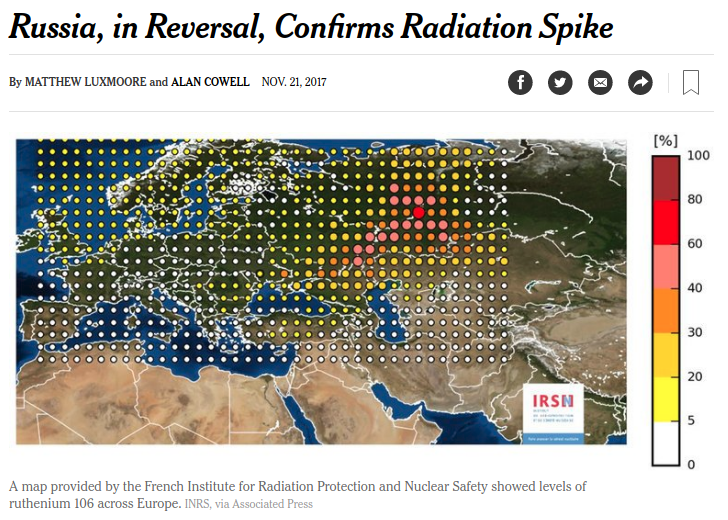 The problem is the caption, which claims that it shows “levels of ruthenium 106 across Europe”. It’s immediately clear that this is not what the graphic shows by looking at the color scale, which is in units of percent. Together with the plot, this would imply that parts of the Ukraine are ~50% ruthenium 106. By volume? By mass? Either way, it’s orders of magnitude away from plausibility. This mischaracterization doesn’t affect the main message of the article: that despite initial denials Russia admitted that the spike probably originated in the Urals. What it does do is muddy the message and detract from the story. 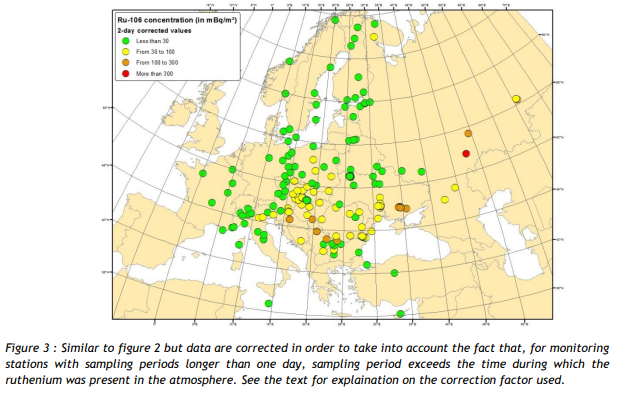 The radiation was not detected in the Urals but at wide range of monitoring stations in Europe. The caption also implied that the radiation was ongoing, but in fact it had dissipated more than a month earlier. At the end of the day, everyone makes mistakes and this one is far from being the worst. I’m just surprised that no one at the Times wanted to correct it.